Here at Feetunique we spend a lot of time thinking about colour and its connotations. You might have noticed. But purple is one that we still can’t work out. That’s why there’s only one thing for sure we can say about our Flat Purple Shoelace - the rest is just speculation. That one thing is that there’s more to purple than meets the eye. Purple is like an onion. It has layers. So let’s try and unfurl some of those purple layers. On the face of it these laces are jazzy and creative. But go deeper and there’s something mysterious about them. At a glance you might mistake them for black or navy blue or something a bit more sensible. But take a closer look and you’ll start to see the real magic of the mighty purple. These laces are bold and outspoken, but they also understand that there’s a time and a place for that. Like a clown at a funeral, purple knows when to rein it in and can go either way depending on the situation. 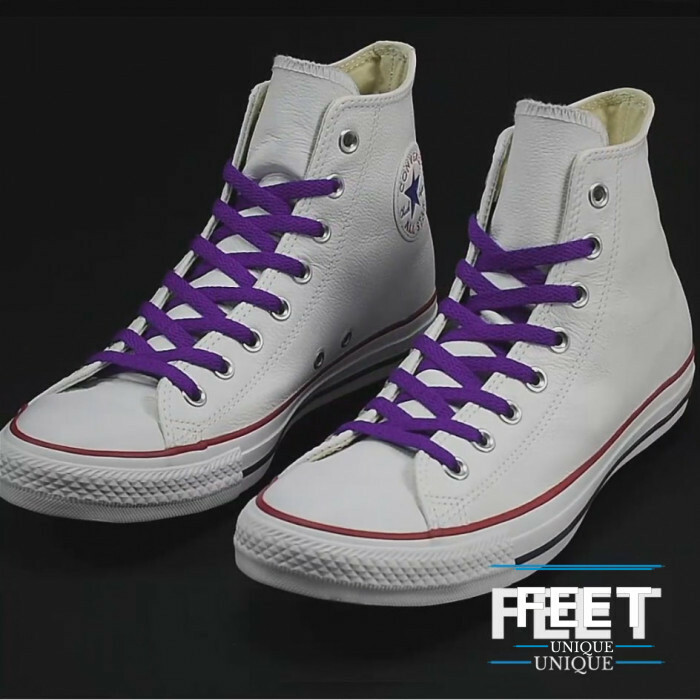 We recommend our flat purple shoelaces with shades of black and white, along with other colours that help to take the edge off. Alternatively, why not pair them with yellow, green or red for a bold combination that’s bound to get your kicks noticed?